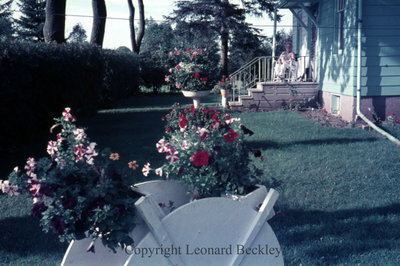 A colour slide of Elizabeth (Betty) Beckley sitting on the front porch of her house at 609 Pine Street in Whitby, Ontario. Leonard Beckley was born in Bude, Cornwall, England on 17 September 1905. He immigrated to Canada in 1910 with his parents, Richard and Jane, and his three brothers Herbert, Victor and Edgar. The family would move to 509 Beech Street, Whitby, Ontario circa 1916. He married Elizabeth (Betty) Ellen Roberts (1901-1984) and they did not have any children. They lived at 609 Pine Street, Whitby, Ontario. Elizabeth Beckley, September 1976, Leonard Beckley. Whitby Archives A2014_004_257.